Andrij Babytsch is a colorist. His media are pastel or oil; his subjects are portraits and landscapes. His portraits have well-defined spectra of color, and show simplicity of execution where details are minimal but unexpected in their intention. In his landscapes, he uses tones and shades of colour to express his feelings onto canvas. Born in Ukraine in 1921. Has lived in Canada since 1948. Studied art at the University of Innsbruck, Austria (1946-1948) and the Ontario College of Art, Toronto (1953-1958). Active in the Ukrainian community: past president of the “Kozub” Literary Society (1985-1996) and the Ukrainian Association of Visual Artists of Canada (1994-2002). Individual exhibitions: Ukrainian Canadian Art Foundation – 1987, AB. Art Studio – 1987, 1988, 1989, 1990, 1991. Group exhibits: Multicultural Art Exhibition in Innsbruck, Austria, 1947; Wayne State University, Detroit, MI, 1960; Toronto, 1954; New York, 1967 and 1994; Art Gallery of Cobourg, Ontario, 1980; the Ontario Society of Artists, Toronto, 1984-1985; Rodman Hall, St. Catharines, Ontario, 1984; Society of Canadian Artists, Toronto, 1994. And many other group shows in Toronto and abroad. He was a finalist of the 2nd Biennial, International Artists Pastel Society Convention in Kansas City, Missouri in 1997. 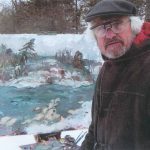 At the 3rd Biennial Convention in Albuquerque, New Mexico, 1999, he was showcased in the magazine Pastel Artist International, Sept./Oct., 1999 as master pastellist of the world from Canada.